This article explains how to transfer your Drupal website from Drupal Gardens to Just Host. Do not delete any of the files you have exported. It's a good idea to keep them as a backup in case there is an error during the transfer of your site to Just Host. The file exported from Drupal Gardens will be a .tar.gz archive file. You will need to extract the file and upload some of its contents to your Just Host account. This process will vary depending on your computer. 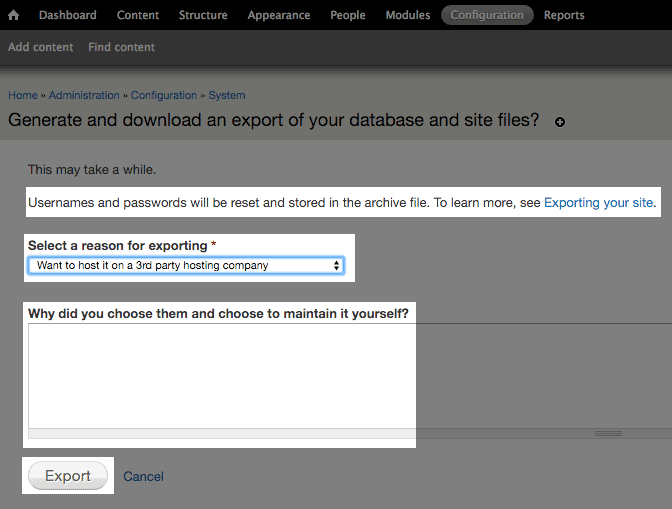 For security reasons, there are a few files in the export that should never be uploaded to your Just Host account. Open your preffered FTP program and connect to your Just Host account. Note: For help with FTP please see FTP Setup Using Filezilla. Inside your Just Host account go to Hosting. Go to the Hosting section of your Just Host account. In your Just Host account, go to Hosting then click on cPanel. That's all for modifying the .htaccess file. You can close your File Manager. Your site will now be functioning on your Just Host account.